2. Search for the appropriate client to add a new pet to by entering the client�s last name, or last name and first name (Format: Last Name, First Name) in the Client Search input box. 3. Push the LOCATE button which is to the right of the input box (or, you may press the Enter key on your keyboard). 4. When the client you wish to add a new pet to is located, choose the client by double clicking on one of the yellow highlighted fields (Account, First Name, or Last Name). This action will take you to an Arrivals screen pertaining only to this particular client. NOTE: If client was NOT found, determine if client is new or that client file may be archived in old history. If client is new, process as describe in Client Module. If client is former client check in archive records for former client/pet activity. 5. Push the ADD PET button located at the bottom, left-hand side of the screen. 6. You will now be at the Pet Modification screen shown below. You may enter the pet�s name, species, breed, etc. by typing the information in the designated area and then pushing the TAB or ENTER key to record the information entered and move to the next field. Use the mouse to move between the tabbed areas (Main Data, Misc Data, History, etc.) to enter additional information concerning the pet. 7. When all information is entered, push the OK button at the bottom, right-hand side of the screen which will return you to the Arrivals screen pertaining to the particular client. At this point you may perform other functions pertaining to the client, or push the OK button at the bottom, right-hand side of the screen to return you to the main Arrivals screen where all clients are listed. 2. 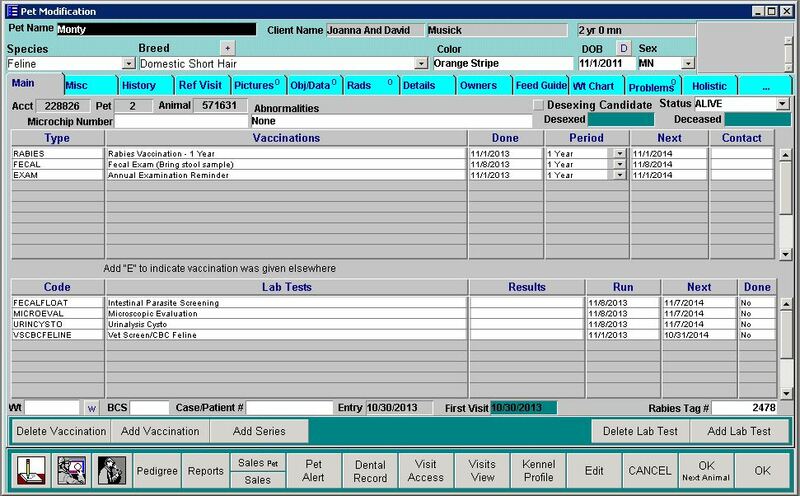 Search for the client whose pet�s information you wish to modify by entering the client�s last name, or last name and first name (Format: Last Name, First Name) in the Client Search input box and then pushing the LOCATE button which is to the right of the input box (or, you may press the ENTER key on your keyboard). 3. When the client whose pet�s information you wish to modify is located, choose the client by double clicking on one of the yellow highlighted fields (Account, First Name, or Last Name). This action will take you to an Arrivals screen pertaining only to this particular client. b) or single clicking one of the yellow highlighted fields concerning the pet (# or Pet Name) and push the MODIFY PET button located at the bottom, left-hand side of the screen. 5. Either of these actions will take you to a Pet Modification screen where you update information concerning the particular pet. Use the TAB or ENTER key to navigate from one field to the next, and use the mouse to move between the tabbed areas where additional information is recorded (Main Data, Misc Data, History, etc.). 6. When all modifications to the pet�s information have been entered, push the OK button located at the bottom, right-hand side of the screen which will return you to the Arrivals screen pertaining to the particular client. 7. At this point you may perform other functions pertaining to the client, or push the OK button at the bottom, right-hand side of the screen to return you to the main Arrivals screen where all clients are listed.